The next batch of tile is not the same finish? How to even it out. Some tile are rougher than others. All the above involve uneven finishes. The following steps apply to all of the above conditions. 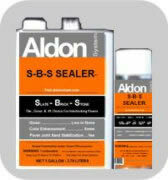 Seal the grout and the tile with Aldon "S-B-S Sealer". (You do need to seal the grout, but may not need SBS Sealer on your tile. See if the next step of "Lifeguard" will be all you need on the tile). Finish with Aldon "Lifeguard" for additional gloss and wear protection. This will also "even out" differences in gloss between tile batches.